Wedding games are played when well wishers in ancient chinese wedding gate-crashed the bridal chamber to tease the bride and groom. Some believed this tradition originated with good intentions. The groom’s relatives and friends wanted to frighten off any evil spirits lurking nearby by making the bridal chamber noisy and crowded. 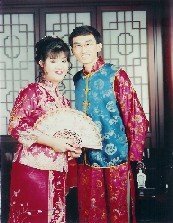 In the past when marriage was arranged, the bride and groom were strangers meeting for the first time on wedding night. These gate-crashers played a crucial role in helping the couple break the ice with cheeky wedding games. 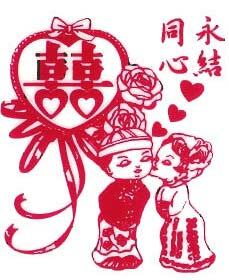 Modern day chinese couples now marry after courtship and are hardly strangers to each other. However the tradition of gate-crashing the bridal room is still observed by friends who want some fun at the couple’s expense. In fact wedding games are played not just during gate-crashing of the bridal room but also when the groom arrived in the morning to fetch the bride and at the wedding dinner. This is a mild wedding game requiring the bride and groom to come up with endearing nicknames for each other. Guests may reject the names if they do not like them. Guest couples are invited to demonstrate kissing to the bride and groom who will imitate or outdo them. The groom or bride will act out words or phrases for the other party to guess. Words or phrases will usually require suggestive actions. Guests may impose penalty if the other party cannot answer correctly. The groom is blindfolded and asked to identify his bride from a group of ladies by smell only. He will kiss his choice before removing his blindfold. You can also play Who’s the groom. Where do the banana, cherries and raw egg fit in? The blind folded bride will eat banana slices placed strategically on neck and face of the groom. A banana is hung on an elastic cord. The groom will jump up and catch hold of the banana using just his mouth. The bride will assist to unpeel the banana using her mouth only. Together, they will eat the banana without using their hands. The bride and groom will eat cherries hung on a string together without using their hands. There is also a version where two cherries were strung in strategic positions on the bride, and the groom will eat them while blindfolded. I have seen this wedding game played with raw and hardboiled egg as well as ice cube. The bride will pass the object up one leg of the groom’s pants, then down and out the other leg. The ice cube is cold and melts fast, causing quite a bit of squirming from the groom. The time I saw a raw egg being used, one of the male guests slapped the bride’s hand against the egg when it was in the pants, causing the groom quite a bit of discomfort. Be careful when this wedding game is proposed. Use your bargaining skills to tone down the game. Some of the wedding games can get quite ridiculous such as getting the groom to eat or drink strange concoctions. Just keep your wits and be very polite. Remember that you can always decline to proceed with any of the wedding games rather than risk losing your cool when things get out of hand. You can also ask some of your close friends to help fend off the more ridiculous games, returning the favor at their wedding.